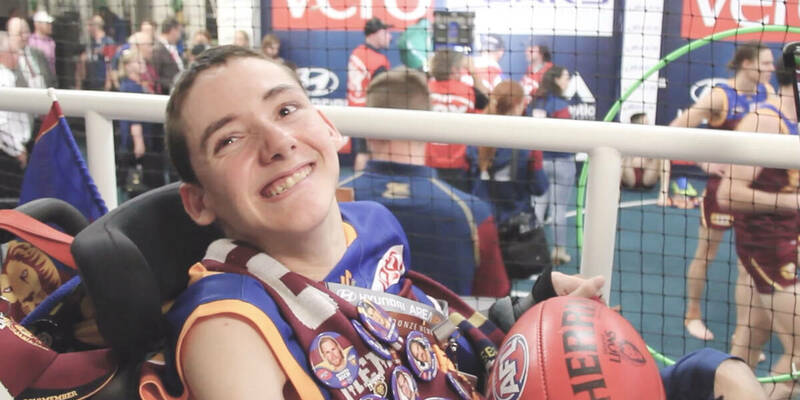 Mega fan Ace inspired a whole team and fan community when his wish came true to be a part of the Brisbane Lions’ inner sanctum. 18-year-old Ace suffers from a condition called dystonia. He is completely reliant on his electric wheelchair and can only communicate through an electronic device. None of this stopped him from motivating the Brisbane Lions footy team to win when he visited their pre-game training session. Ace had the entire group in stitches with his funny wise cracks and inspired them with telling his story. 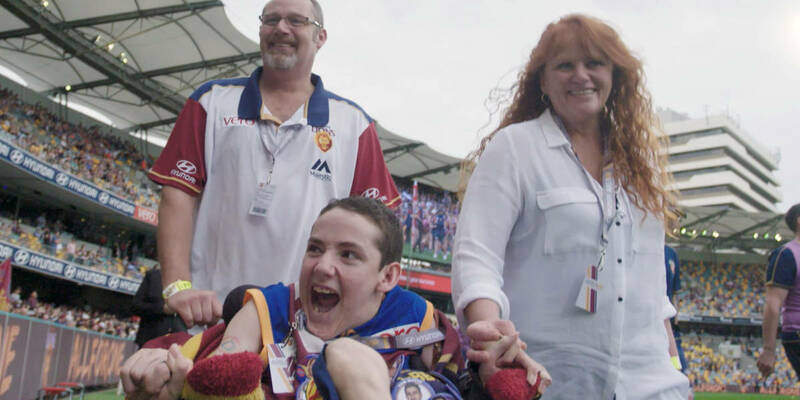 It was a special moment for everyone when his favourite player Daniel Rich presented him with his very own Lions guernsey. Coaching staff, players and the high performance team all gathered around Ace to share key insights with him and get to know this incredible young man. The Lions coach then asked Ace’s mum Raylene if they could have the honour of her and Ace doing the coin toss at the upcoming game. They also thanked her for everything she does for ‘their main man Ace’. In the team's pre game pep talk, the Lions coach inspired the players with quotes Ace made when he visited their training session. Coach said, “the team had to win for themselves but most of all they had to win for Ace”. "As the boys prepared for the game, they chanted his name, “ACE, ACE, ACE”." The Lions dedicated their game to him and as a constant reminder during the match why they had to win, players wrote Ace’s name on their strapping tape. And it worked! The Lions won! As the players ran out the back to sing their team song they each stopped to thank Ace for all his support. The crowd was on their feet cheering for Ace and even the coach came up to him and his family and said it was all because of him that they won. There are 700 kids like Ace on a Wish Journey in Australia right now. We rely on the generosity of donors, volunteers and local communities to make it happen.